On Monday, Rep. Maxine “No justice, no peace” Waters, the California Democrat who admitted to Elle that she’s out to “get” President Trump, expanded her attack to include the millions of Americans who support the chief executive. While speaking on the floor of the House of Representatives on Monday, she questioned the patriotism of Trump supporters and reiterated her life mission to remove Trump from office. “Mr. Speaker, my position against this president and his administration is clear. I oppose this president. I do not honor this president. I do not respect this president,” she said. “African-Americans have struggled and fought historically, many African-Americans have paid a huge price fighting for justice and equality in this country, have died for it. I don’t have to call the names of Martin Luther King and all the others. We have paid a price, we have fought. “But guess what? Despite the fact that America has not always been there for us, we’ve always been there for America. We have fought in America’s wars. We have suffered discrimination, we have suffered isolation and undermining. 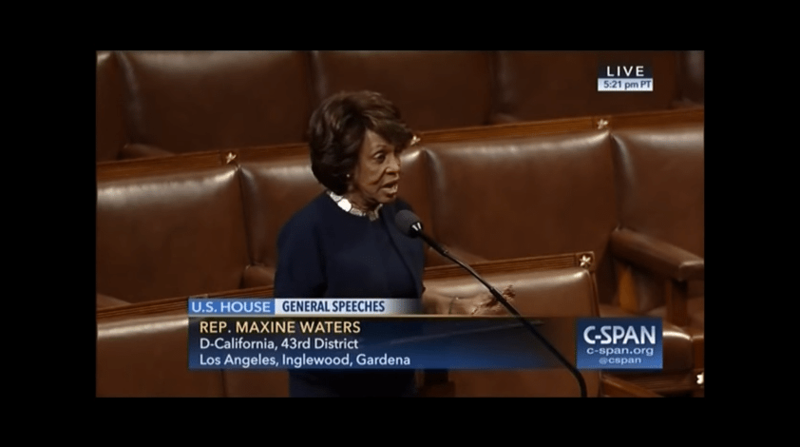 But we stand up for America, oftentimes when others who think they are more patriotic, who say they are more patriotic, do not,” Waters added. Waters made it clear her mission is not to represent her constituents, but destroy Trump. The president “is not good for America,” she said. “African-Americans know this. The Black Caucus understands this. And for those members of the Black Caucus representing our leadership, who went to meet with him, they have laid out to him all of this, what our care and concerns are all about. But in the final analysis, we really don’t expect anything from him. “And my mission and my goal is to make sure that he does not remain president of the United States of America,” Water said. While Waters has been getting most of the attention for so often calling for Trump’s impeachment, she’s not alone. Other congressmen like Rep. Mark Pocan (D-WI) have thrown the word around and on the day of Trump’s inauguration, dozens of Democratic lawmakers were absent, protesting who they believed was an illegitimate president. A February survey from the Public Religion Research Institute suggests their rhetoric is not out of the mainstream among Democrats outside of Washington. A majority of those polled said they’d be fine with impeachment.